Youth ages 11 and up are welcome to volunteer at the Park and Recreation Summer Programs. Copies of the volunteer informational booklet can be found online, on our facebook page, or picked up in the Park and Recreation Office (178 Rosemary Street) beginning on Monday, April 1st. Registration begins - Wednesday, April 10, 2019 from 5:00 - 6:30pm, and will continue thereafter during normal office hours. Registration ends - Friday, June 7, 2019 at 5:00pm. Volunteers and parents are required to sign the back side of the Volunteer Application for it to be accepted. As long as the application is signed by the volunteer, the volunteer does not need to be present. This is also true for the parent; as long as the application is signed by the parent, the parent does not have to be present. There is a $25 fee for our volunteer program. This fee covers the costs for all volunteer materials including the volunteer tee-shirt and mandatory training supplies. Volunteers are required to provide a character reference to complete their application. The reference is not required at the time of registration but must be submitted to the Park and Recreation office no later than Friday, June 14, 2019 at 5:00pm. Most frequently asked questions are answered in the informational booklet, but any additional questions can be addressed to the Park and Recreation Office (781-455-7930). This program runs in eight, one week sessions. The ages of the participants range from 3 to 5 years old. There are two volunteer sessions each day. The morning session is 9:00am – 12:00pm and the afternoon session is 1:00 – 4:00pm. Volunteers will help set up, break down, clean up, and help participants with different activities including crafts, story, and snack time throughout the day. Mini-Evergreen will be held at the Mitchell Elementary School. This program runs in eight, one week sessions. The ages of the participants range from 5 to 7 years old. There are two volunteer sessions each day. The morning session is 9:00am – 12:00pm and the afternoon session is 1:00 – 4:00pm. Volunteers will help set up, break down, clean up, and help participants with different crafts and activities throughout the day. Kidzart will be held at the Mitchell Elementary School. This program runs in eight, one week sessions. The ages of the participants range from 5 to 8 years old. There are two volunteer sessions each day. The morning session is 9:00am – 12:00pm and the afternoon session is 1:00 – 4:00pm. Volunteers will help set up, break down, clean up, and help participants with different activities and games throughout the day. Cricketeer Adventure will be held at Cricket Field, House, and Playground. This program runs in four, two week sessions. The ages of the participants are 3 years old and up. The volunteer session is 9:00am – 12:00pm. Volunteers will help set up, break down, clean up, and help participants with different swim lesson activities throughout the morning. Swim Lessons will be held at Rosemary Recreation Complex. This program has an eight week session. The ages of the participants range from 5 to 10 years old. There are two volunteer sessions each day. The morning session is 9:00am - 12:00pm and the afternoon session is 1:00 - 4:00pm. Volunteers will help set up, break down, and help participants with different games and activities throughout the day. Summer Playground will be held at the Mitchell Elementary School. This program runs in eight, one week sessions. The ages of the participants range from 7 to 13 years old. There are two volunteer sessions each day. The morning session is 9:00am – 12:00pm and the afternoon session is 1:00 – 4:00pm. Volunteers will help participants with set design, script writing, and different activities throughout the day. Kids Off Broadway will be held in the Newman Elementary School. This program has eight, one week sessions. The ages of the participants range from 8 to 13 years old. There are two volunteer sessions each day. The morning session is 9:00am - 12:00pm and the afternoon session is 1:00 - 4:00pm. Volunteers will help participants during trail walks and set-up different activities and games throughout the day. Outdoor Living will be held at Rosemary Recreation Complex. This program runs in eight, one week sessions. The ages of the participants range from 7 to 13 years old. There are two volunteer sessions each day. The morning session is 9:00am - 12:00pm and the afternoon session is 1:00pm - 4:00pm. 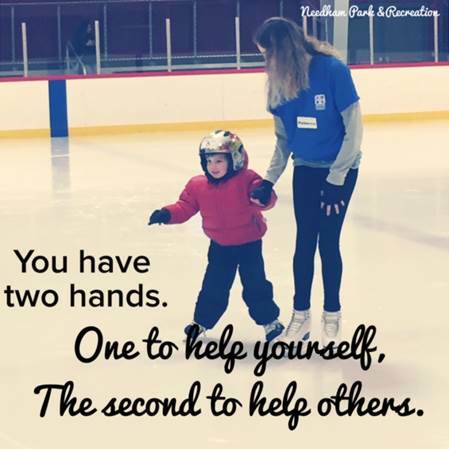 Volunteers will help set up, break down, and help participants with different skills, games, and activities throughout the day. Sports Specialties will be held at Needham High School. This program runs in seven, one week sessions. The ages of the participants range from 8 to 13 years old. There are two volunteer sessions each day. The morning session is 9:00am – 12:00pm and the afternoon session is 1:00 - 4:00pm. Volunteers will help set up and organize drills and activities. Tennis Academy will be held at the Needham High School. *Must have experience playing tennis at the High School level or in an organized league to volunteer for this program.